It has been a busy time this summer as many of us Miistakians take some time to relax and enjoy time with family and friends while continuing to move our conservation initiatives forward. One of our partnership initiatives is celebrating a significant success this summer. Miistakis has been working together with several conservation partners to ensure mitigation for the safe passage of wildlife along Highway 3 in southern Alberta. This summer, Alberta Transportation will be addressing one of the priority mitigation sites located adjacent to Crowsnest Lakes, where they will be constructing fencing and jump-outs in conjunction with an existing underpass. These efforts will improve both human and wildlife safety by reducing wildlife-vehicle collisions, while also facilitating movement for bighorn sheep in the region. This milestone is significant as it demonstrates Alberta Transportation’s commitment to addressing human and wildlife safety in the absence of a highway upgrade project. We look forward to continuing to work with Alberta Transportation to address wildlife movement and human safety along Alberta’s highways. I am very pleased to announce that Miistakis was a recent recipient of the Government of Alberta’s Watershed Resiliency and Restoration Program grant program. This program aims to improve natural watershed functions in order to build greater long-term resiliency to droughts and floods. This grant will support our collaborative Putting Beavers to Work program and will be used to offer workshops on why beavers play an important role in our watersheds and practical tools that can be used to enable beaver coexistence. The funds will also be used to create, document, and monitor beaver coexistence demonstration sites that will be important for promoting the use of tools to coexist with beavers for watershed health. Lastly, I would like to take this opportunity to express our condolences to the family and friends of Harvey Buckley, who passed away in July. Harvey was a giant in the conservation community: a man with an unparalleled commitment to the conservation and the preservation of agricultural landscapes. Miistakis was fortunate to learn a great deal from Harvey, and our environment will reap the rewards of Harvey’s vision and hard work for many generations to come. 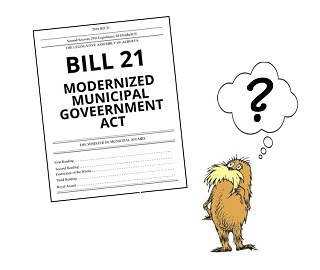 It was a bit of an emotional rollercoaster for me when the proposed amendments to the Municipal Government Act came out (Bill 21 – Modernized Municipal Government Act). Included in the amendments was a new type of reserve, the Conservation Reserve. Finally, I thought, municipalities had a tool in their primary legislation that would allow them to protect environmental values! And then I read section (2) … Sigh. Born and raised in Calgary, I have always loved the nature that surrounds and runs through this city. I have had a passion for ecology and conservation from the time I was a child, when my family would travel to nearby wetlands in the evening to listen to the calling frogs and red-winged blackbirds in the spring. I am now a wildlife biologist, pursuing my passion as a career. The first time I heard of the Miistakis Institute was through my Mount Royal University Professor, Dr. Dorothy Hill, who informed us about a writing contest that the Miistakis Institute was hosting regarding beaver relocation into areas where they had been extirpated. Recently, I started volunteering with the Miistakis Institute on the Call of the Wetland project, and since March of 2016 I have been ground-truthing wetlands to determine if they are a good candidate for the citizen science survey component, which launches in spring 2017. Volunteering for Call of the Wetland has been an extremely rewarding experience; I have had the opportunity to network with other professionals, gain practical field experience, enhance my amphibian identification skills, and participate in a grant interview on behalf of Call of the Wetland. 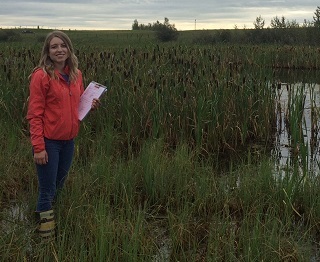 My volunteering with Call of the Wetland has not only provided me with many opportunities to give back to the Calgary community while enhancing my skills, but it has also led to employment with the Miistakis Institute. In June, the Miistakis Institute hired me to create the scientific methodology for quality control of the Call of the Wetland program. The Southern East Slopes Collaborative is a coordinated group of conservation organizations working together to create a bold, detailed, proactive land use vision for public and private lands along Alberta’s Southern East Slopes that prioritizes conservation and unites ENGOs to work more strategically to promote landscape protection and management. While the core group is driving the process, other individuals and conservation organizations working in southern Alberta are critical to the process and will be engaged throughout. Core organizations are CPAWS Southern Alberta, Y2Y, SALTS, and the Miistakis Institute. 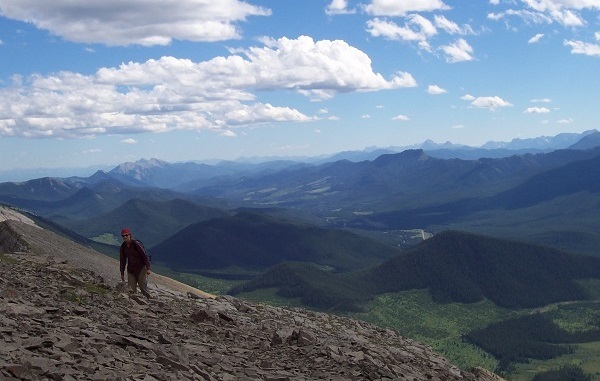 This work, funded by the Calgary Foundation, will help conservation organizations, watershed groups, municipalities, and provincial land managers focus conservation work on the Southern East Slopes. Central to this work is the creation of conservation assessment reports for identified conservation priorities. These reports will include: the current state of knowledge and best available science; identification of threats and opportunities (existing policy and planning processes and on-going conservation activities); identification of gaps in science and policy; and strategies for each conservation priority. This work is on-going and will continue throughout the fall. Miistakis was fortunate to get the opportunity to be part of “A Conversation on Conservation” on August 17th. This speaker series event was hosted by the Government of Alberta’s Watershed Resiliency and Restoration Program (WRRP). The goal of the day was to promote the conservation of natural watershed features by providing an overview of tools available, examples of successful projects, and guidance on implementing conservation practices. This event took place in Spruce Grove and was webcast across the province. There was great participation and energy in the room (especially for a sunny August day in the midst of a rainy summer! ), and we saw a lot of familiar faces from all across the province. Miistakis’ Guy Greenaway gave a presentation called, “Pieces of a Conservation Puzzle: Land Trusts, Conservation Easements, and Transfer of Development Credits ”, a copy of which you can download here. The event also included talks by Larry Simpson of the Nature Conservancy of Canada – Alberta, Nancy Davy from the Grand River Conservation Authority in Ontario, and Harry Harker from the University of Calgary. Participants also got quick updates on several Government of Alberta initiatives from Jason Cathcart, Anish Neupane, and Karen Raven. Our thanks to Monique Dietrich and Eric Macknak of the WRRP for organizing the day and inviting us to participate!